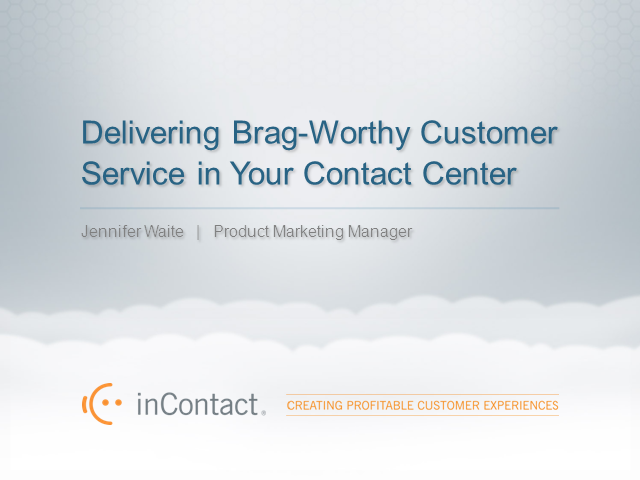 Join CCNG partner inContact and hear from Jennifer Waite, Product Marketing Manager as she shares ways to deliver brag-worthy customer service in your contact center. When customers are unhappy about customer service, more and more of them are turning to sites like Twitter and Facebook to make those complaints public. A misstep from a contact center agent can suddenly become an incident that is shared with hundreds, if not thousands of current and prospective customers. In this environment, your company must continually go above and beyond to provide the type of service that is truly brag-worthy. In this webinar, learn how you can deliver brand-building customer service that actually stands out from the norm. This is a previously recorded webcast in association with inContact.